The main difference between sensing and intuition is that the sensing focuses on what can be detected through the five senses while intuition focuses on the impressions and patterns created from the gathered information. Sensing and intuition are two psychology dichotomies first identified by Isabel Briggs Myers. These two govern the basic operations we use from day to day phenomena to analyze and solve problems. Although they both concern our psychological statue, there are many distinctions between them. Therefore, in sensing, a person pays more attention to things at present, or in other words, what he/she achieves from these five senses at that current moment. He or she also forms ideas and opinions based on that particular subjective experiences. Hence, they use this factual and realistic information to find solutions to the problems they face. People who use sensing over other are known as ‘sensors’, and they are considered more as literal thinkers who value realism and common sense of things. Therefore, they pay close attention to even the smallest detail they gather, while also been keen to note the inconsistencies within those details. Therefore, sensing allows them to pay more attention to their surroundings. Hence, they like more practical applications of things or concrete resemblance of their factual opinions. 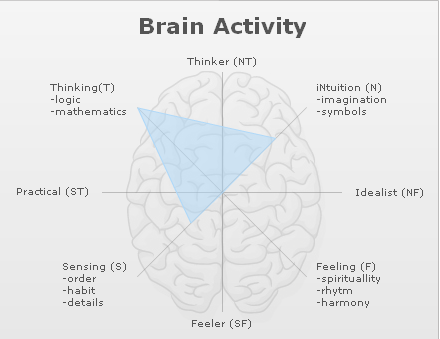 Moreover, it is identified that almost three out of four people use sensing while the rest use intuition. More specifically, it has been discovered that comparatively, females tend to use sensing more than males in their daily lives. Intuition refers to the psychological preference where one uses the impressions and patterns they have gained in their lives in their daily circumstances. Therefore, if one likes to work with symbols or abstract theories, even without knowing what they will offer, or if one remembers events more as an impression of what it was like than as actual facts or details of what happened, then that person uses his/her intuition over sensing. Similarly, those who use intuition are more open-minded in nature and therefore, they welcome the new possibilities in life while also accepting the novelties they can offer them. Therefore, they rather prefer to live in the future spectrum, the sensing people. Furthermore, with intuition comes the imagination power and the creative ideas. As a result, intuition allows the people fantasize, imagine while also analyzing and questioning why certain things have happened that way and how they might most probably happen in the future as well. Therefore, those who prefer intuition tend not to live in the world created by the factual and the concrete facts like those who prefer sensing. Moreover, they are those who can gather facts by ‘reading between the lines’. However, in a general sense, intuitive decision making is more than using common sense since it involves additional sensors to perceive and get aware of the information from outside. Sometimes it is referred to as gut feeling, sixth sense, inner sense, instinct, inner voice, spiritual guide, etc. We use both these psychological preferences to solve our daily problems and complexities while they also impact our mood and creative thoughts. Sensing focuses on what can be detected through the five senses while intuition focuses on the impressions and patterns created from the gathered information. Sensing primarily uses the data collected from our five senses: vision, hearing, taste, touch and smell while intuition uses these collected data to draw patterns via the imaginative power. The source for sensing is the concrete details gathered by the five senses. Instead, for intuition, it is often the intricacies of emotions and motivations. Usually, sensing uses the present moments and factual data. Therefore, people who use sensing often focuses on the present day. On the contrary, intuition uses a lot of imagination and speculations based on the collected information. Therefore, those who use their intuition over the sensing often are more imaginative and prefer to live in the future. Sensing and intuition are two psychological preferences one can have in life. Even though they serve a main purpose, these dichotomies have their own distinctions. 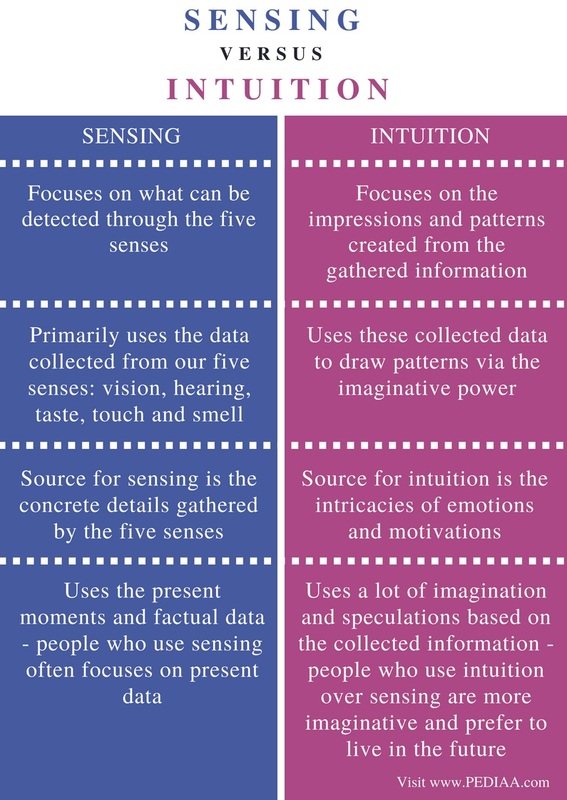 The main difference between sensing and intuition is that sensing focuses on what can be detected through the five senses while intuition focuses on the impressions and patterns created from the gathered information. 1. “The Myers & Briggs Foundation – Sensing or Intuition.” The Myers & Briggs Foundation – MBTI® Basics, Available here. 2. “Sensing vs. Intuition Preference – Personality Types.” Personality Max, Available here. 3. “What Is Intuition, And How Do We Use It?” Psychology Today, Sussex Publishers, Available here. 4. “What Is Intuition, And How Do We Use It?” Psychology Today, Sussex Publishers, Available here.